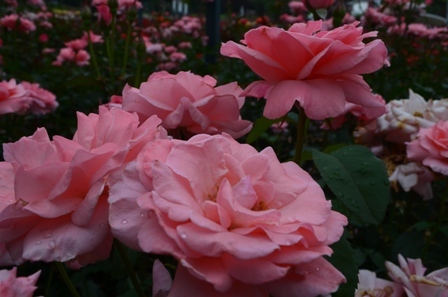 The month of June produces many different rose festivals across Korea. 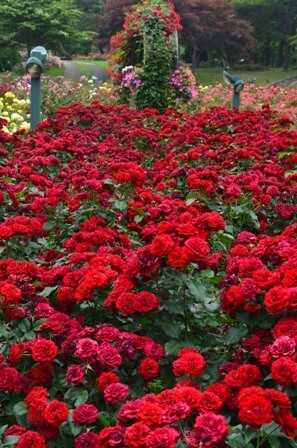 The one I visited this past weekend is hosted at Seoul Grand Park Rose Garden. It’s only a 2o minute subway ride on Line 4 from central Seoul, and about a 10 minute walk from the subway stop. 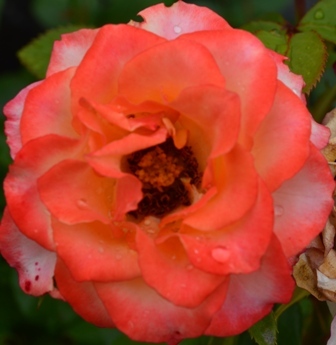 Since the month of June is winding down, peak rose blossoming had already hit, and the roses were slowly dying. 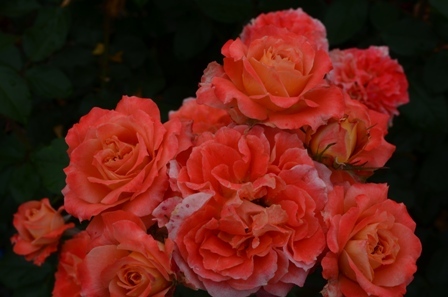 However, there were still plenty of beautiful roses to be enjoyed in their bright, delicate, fragrant beauty. 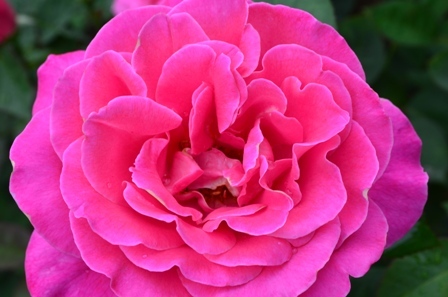 I was at the garden right when it opened, so there was plenty of peace and quiet to enjoy the utter beauty of all the roses. 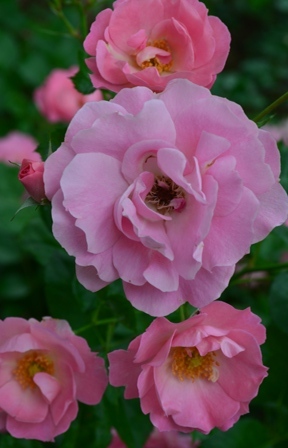 Plus a soft rain had fallen earlier in the morning, so all the roses were sprinkled with delicate water droplets. 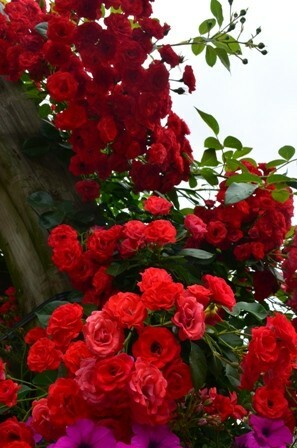 All of the roses were very fragrant, but it was interesting to notice all the different fragrances. 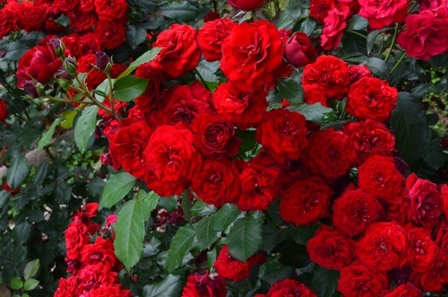 Many of them were the traditional rose scent, but I was very fascinated by the roses that had a sweet, lemon scent to it, because I had never encountered roses like that. 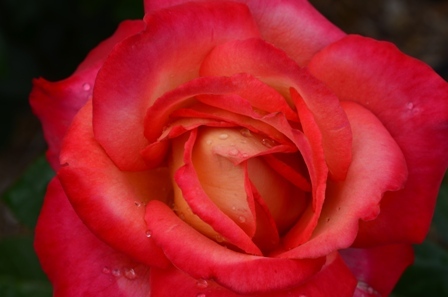 I couldn’t stop taking pictures of flower closeups. 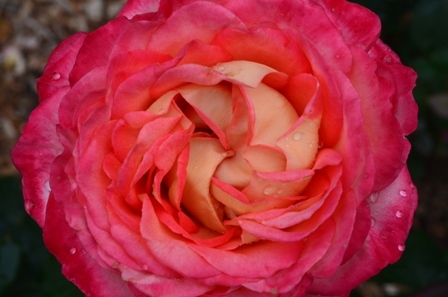 I kept imagining turning these pictures into beautiful, closeup flower paintings. Let’s see how well they turn out when I finally get my art supplies into these projects. 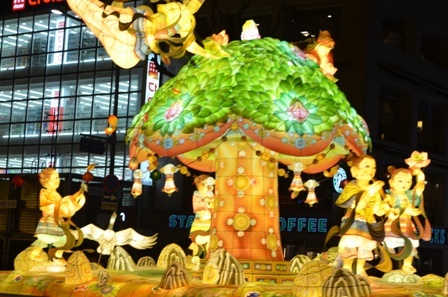 Sunday was the third day of the Lotus Lantern Festival, and that day is all about cultural experiences. 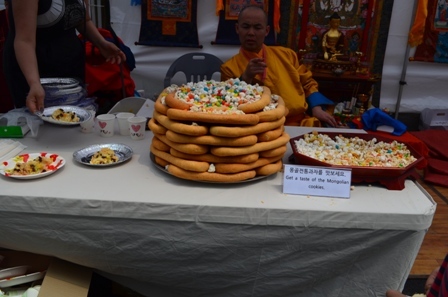 The street in front of Jogyesa Temple is turned into a street fair dedicated to all things Buddhism. Over 100 different booths are set up enabling participants to learn many different things. Examples: different forms of Buddhism in different countries. 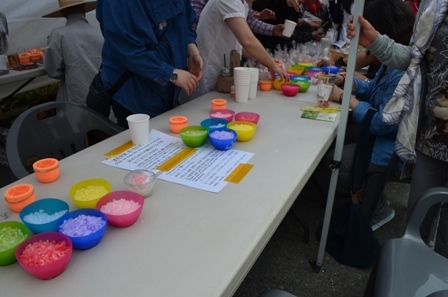 There are also many opportunities to try a wide variety of crafts. There are more crafts than one can do in one day. Participants can make paper lotus flowers. They can craft a bracelet of Buddhist prayer beads. You can make Korean paper or lotus shaped candles. You can decorate masks or make clay objects. 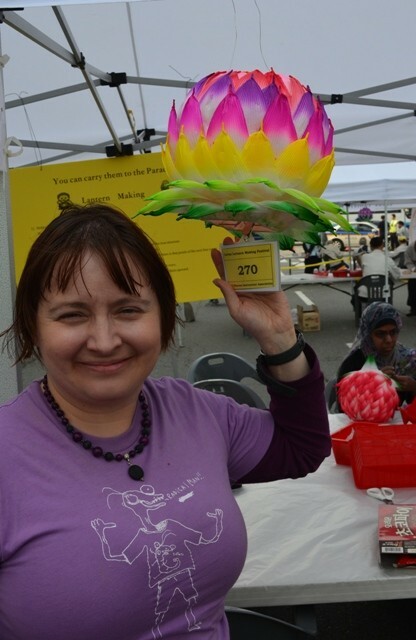 But my absolutely favorite activity at this festival was making a full size paper lotus lantern. 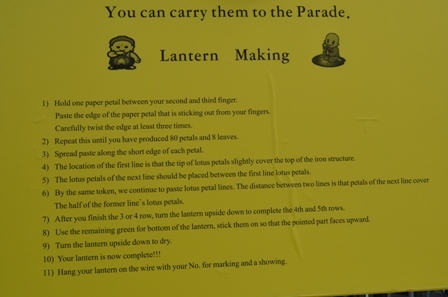 The festival as an area marked off for foreigners to make lotus lanterns. The activity is completely free and you are given all the materials you need to make a lotus lantern in a variety of colors. 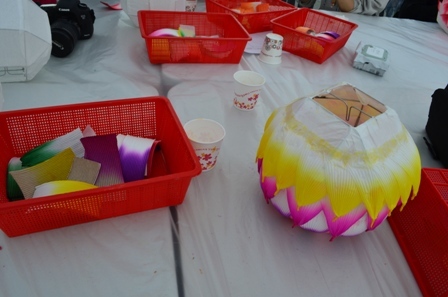 Some people made unicolor lanterns that resembled a real life lotus flower. And other lanterns were a rainbow of bright colors. Making a lantern is rather time consuming, but pleasantly contemplative. It’s actually a bit more involved than you might think having to twist and glue every sheet of paper onto the lantern. 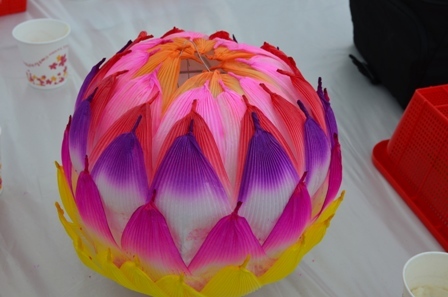 But it’s all worth it at the end when you have your very own colorful lotus lantern to take home with you. 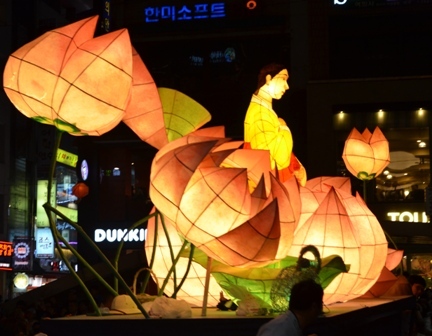 Overall the Seoul Lotus Lantern Festival is one of the best festivals I’ve ever been to. The setting in Jogyesa Temple, decked out with thousands of colorful lotus lanterns is beautiful. The parade is quite a sight to behold. And the cultural experiences day is an enjoyable learning experience. My favorite part of the Lotus Lantern Festival was the abundance of lantern floats that look absolutely amazing at night. These floats ranged from traditional images like dragons and tigers to more contemporary images of children’s cartoons. These floats are just a select few that I particularly loved. What was interesting about so many of these floats is that they were pushed by hand for the entire parade route. There were some outsize floats that were driven by a vehicle, but more often than not, you would see a group of individuals pushing the float. Capturing these floats at night was an interesting challenge. I have a pretty good camera with an excellent night landscape setting. What it doesn’t do as well (or should I say I haven’t found the right settings) is capturing images at night in motion. More than once, my camera would take too long to focus and either the float passed me by, or the image was blurry. The amount of ambient light from surrounding businesses didn’t help either. 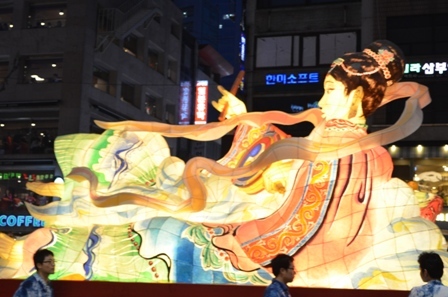 I would highly recommend the Seoul Lotus Lantern Festival Parade (well, the entire festival, but more on that in a follow on post). As I mentioned before, this is probably the longest parade I have witnessed, and there are so many beautiful floats to marvel and enjoy. 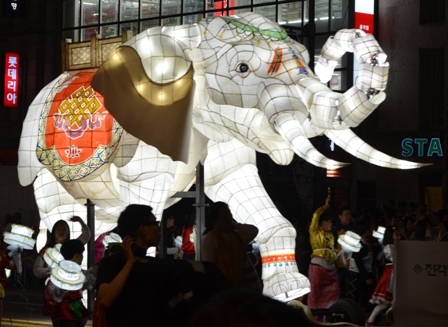 Saturday, May 11th 2013 was the annual Lotus Lantern Festival Parade held in conjunction with the Lotus Lantern Festival. 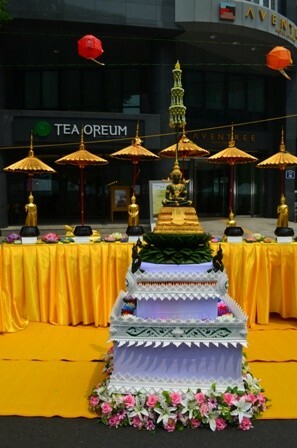 The festival is to honor Buddha’s Birthday and this year the main festival was held May 10-12. 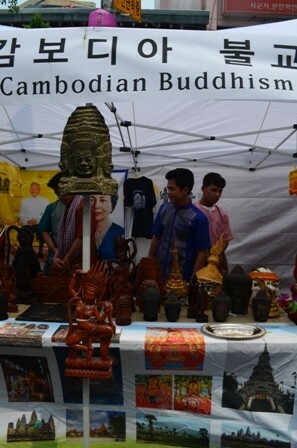 The weekend is packed with a variety of religious and cultural experiences that are a lot of fun and informative. 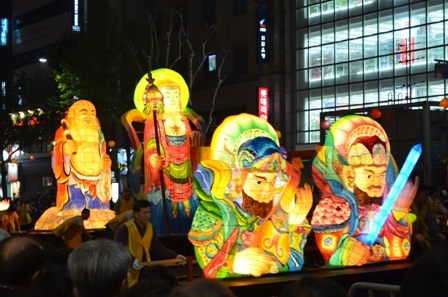 The highlight of the festival is the parade held on Saturday night. This parade is one of the best and the longest I have seen. 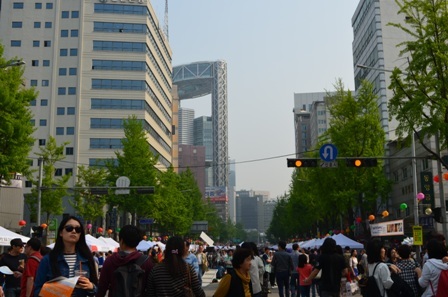 The parade starts at Dongdaemun, the old east gate of Seoul and current home to a large market. 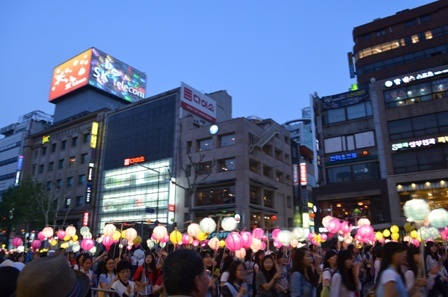 It continues west down Jongno Street to the final destination of Jogyesa Temple, the center of the Lotus Lantern Festival. 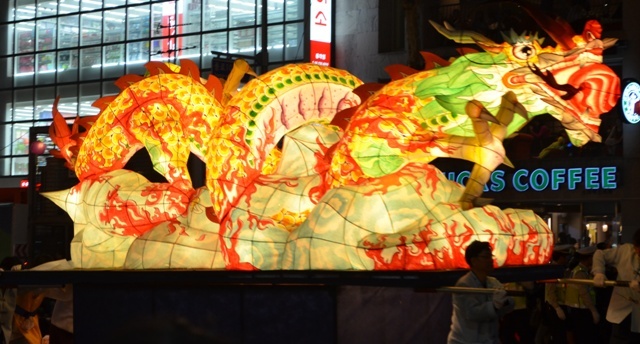 The parade lasts about two hours and consists of a wide variety of lighted lantern floats and marching groups carrying many different types of lanterns. 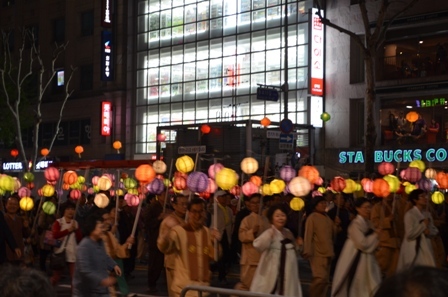 I decided to view the parade closer to the ending point about a 10 minute walk from Jogyesa Temple. When you’re short like I am, it is highly critical to get a good vantage spot to view a parade. The city actually sets up a couple rows of seats for people to sit in and watch the parade along parts of the parade route. I initially assumed that they were reserved for tour groups who paid for them, only to discover (a bit too late) that anyone can sit in them. Even when I get higher up, it seems to happen that someone much taller than me stands right in front of me, so I spend the entire parade jockeying my camera for a good position. It was interesting to contrast the traditional beauty, meaning and celebration of the parade with the neon signs for modern businesses like Starbucks Coffee and Dunkin Donuts right in the background. Seoul is a very modern city with pockets of traditionalism tucked within it. 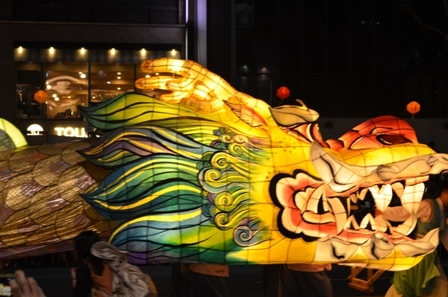 Tourists even have the opportunity to participate in the Lotus Lantern Parade through a special program that consists of lantern making, dinner, walking the actual parade, and the after parade festivities. The catch is that you have to register for it in advance. 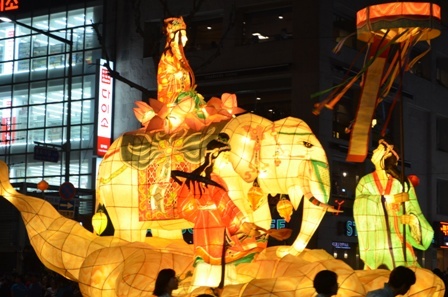 I didn’t do it this time, but next year I want to experience the Lotus Lantern Parade as fully as I can. Springtime in Korea means many things. It means longer days, bright sunshine, an end to bitterly cold winters. 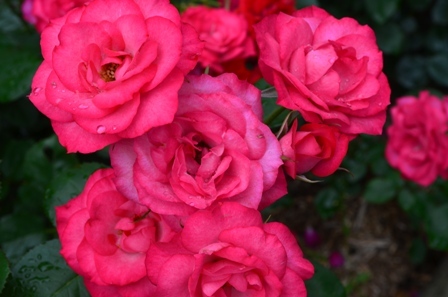 And my favorite thing- the blossoming of Korean flowers. 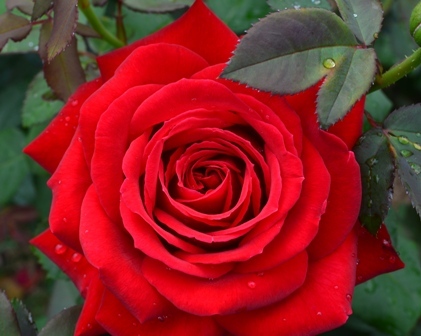 All throughout the countryside different flowers start to bloom beginning in March and continuing throughout spring. 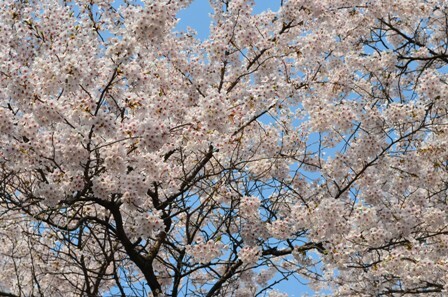 Among my favorite flowers are the numerous cherry blossoms that are spread throughout the city. 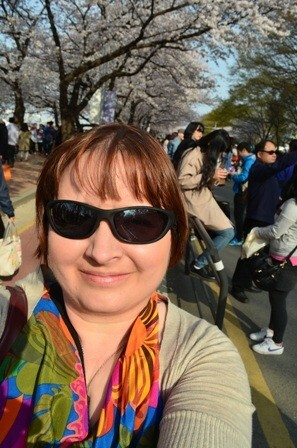 This year I went to two different areas of Seoul to partake in the amazing beauty of the cherry blossom trees- Yongsan and Yeouido. 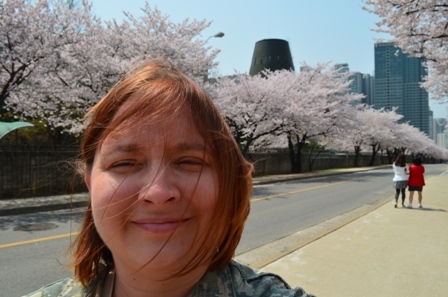 What I love about Yongsan is the view of the urban landscape surrounding the area of the city broken up by bright, beautiful cherry trees lining the roadways. I think this photos sums up the contradictions that is South Korea at the moment. 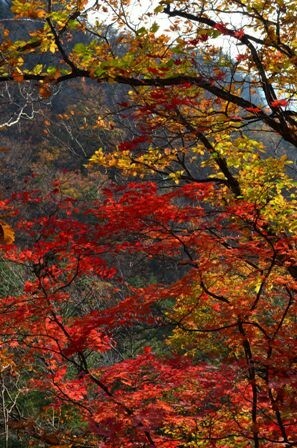 It is a very beautiful country, with a rich history, fabulous temples and palaces and ancient ruins, gorgeous nature, mountain views and colorful trees and flowers. But it is also undeniable that just to the north lies their sister Korea, separated by the Demilitarized Zone since 1953 and technically still in a state of war, though there is an armistice in place (now whether or not North Korea REALLY abides by that now remains to be seen). The greater metropolitan area of Seoul is well within the range of North Korean long range artillery, and security is often in the back of your mind (particularly nowadays with North Korean rhetoric at a particular fever pitch). 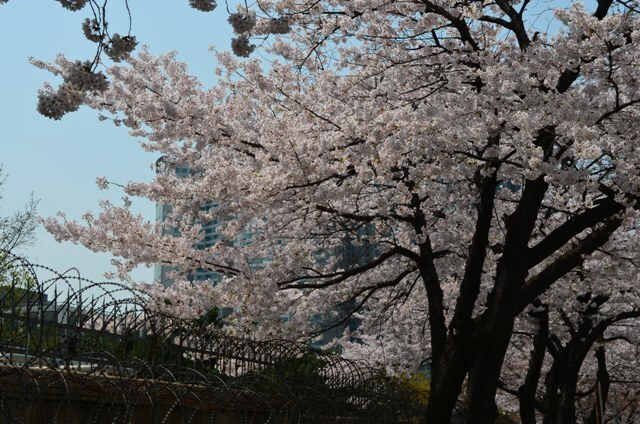 This picture juxtaposes the delicate, ephemeral beauty that is the Korean cherry blossoms against the cold, hard concertina wire designed to protect both military and civilian alike and provide security. It’s hard not to delight in the innocent wonder of the massive amounts of cherry tree blossoms. 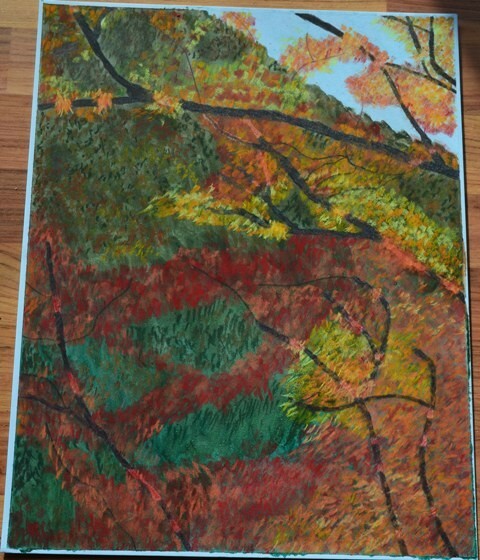 I wanted to capture all the images to create paintings from them later. What I like about Yongsan is that it is comparatively empty. It’s easier to get up close and personal with the cherry trees in relative peace, quiet and solitude. 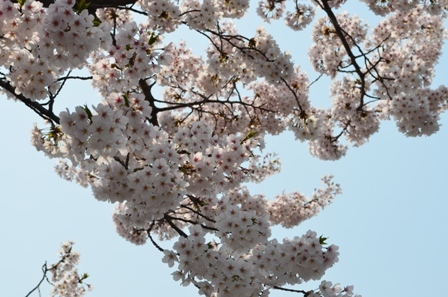 For a different experience, I recommend attending the Yeouio Cherry Blossom Festival. 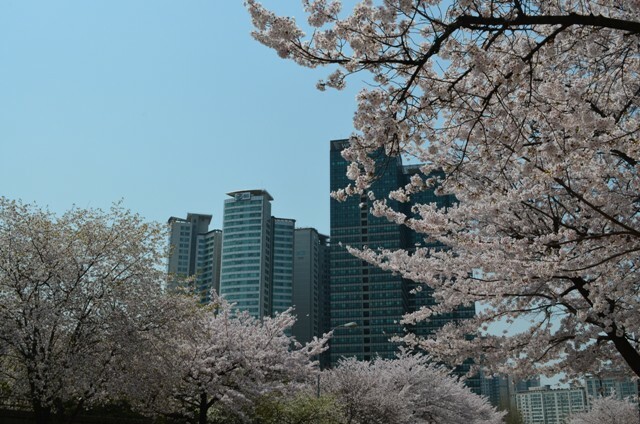 Yeouido Island is another excellent location for cherry tree-lined streets in Seoul, just south of the Han River. 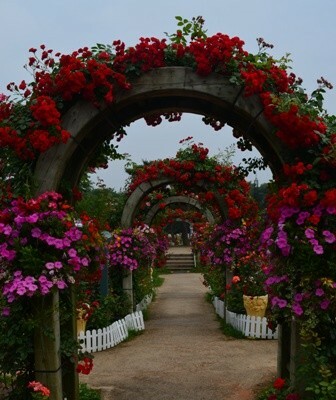 In fact, part of the Hangang park runs along the northern area of Yeouido Island, and is an excellent area to enjoy a picnic, walk, run or bike along the Han River, and enjoy the gorgeous views of Seoul. 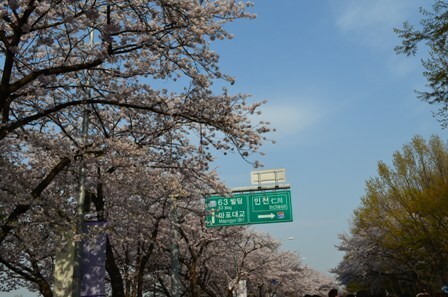 Every year the Yeouido Cherry Blossom Festival is held-this year from 12-21 April 2013. 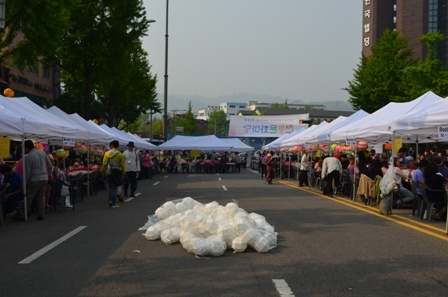 The bulk of the festival is held around the road surrounding the National Assembly on Yeouido Island. 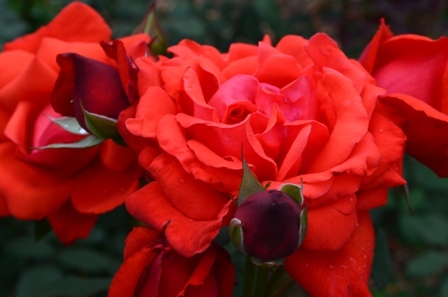 It is easily reached by taking the Seoul subway, Line 9 to National Assembly stop. 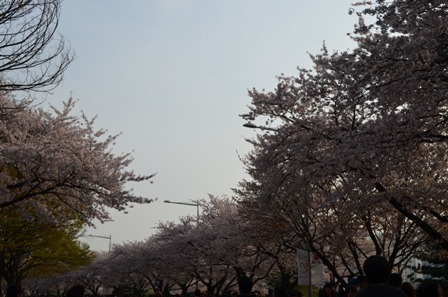 During the festival, the road is blocked off from traffic, which makes it easier for the thousands of visitors to enjoy the cherry trees, take pictures, enjoy musical performances and just relax with the sunny beauty of a Seoul springtime. This is a beautiful area, though it is definitely not for those who don’t particularly like crowds, since the festival is full of them. You have to take advantage of the cherry blossom season, because it certainly isn’t long. 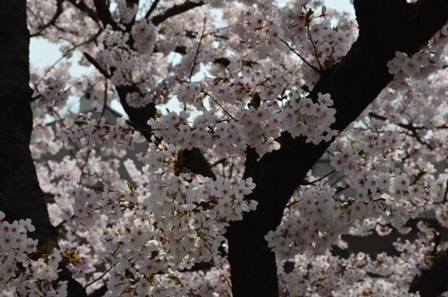 Cherry trees blossoms last about 7-10 days and then they are gone. Already, the cherry trees are shedding, spreading their delicate petals in the wind like pink-white snowflakes along the sidewalks. Soon all the branches will be bare, and you must another year for spring. 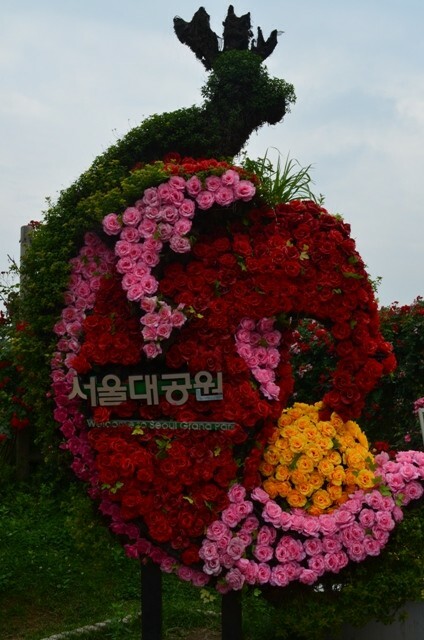 Next year, I want to get farther afield to enjoy different cherry tree festivals, particularly the one held in Hwagae near Jirisan National Park. 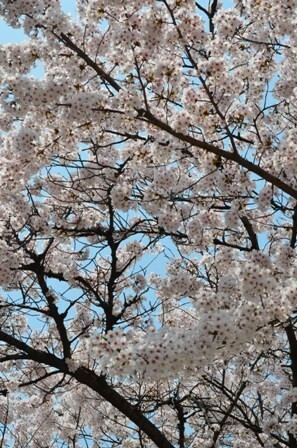 But if you live in Seoul and just want to see some cherry trees, it is very easy to do so without ever leaving the city. I have a “guilty pleasure” while traveling. I say guilty pleasure facetiously, because in reality I don’t feel guilty at all, because it’s just my thing when I travel. Though I have run into fellow travelers who try to make me feel guilty for this particular thing, like I am some sort of ugly American. Ironically enough, one of those same travelers chastising me for this in Egypt was the same one who couldn’t stop moaning for a Starbucks. She completely failed to see the irony in her stance on that one. That guilty pleasure happens to be eating at a McDonald’s in every country I can. I make it a point to eat at a McDonald’s once during every vacation, even if the only one I can find is at the airport. That means everything from long weekends all the way up to month-long vacations. That adds up to be dozens of McDonald’s in dozens of countries. I certainly haven’t eaten in one for EVERY country I have visited. In those cases, the countries typically didn’t have a McDonald’s. It may be one of the biggest global brands, but it still hasn’t made inroads into every country as of yet. The biggest global brand I have ever seen is Coca Cola products. I have NEVER been to one country that doesn’t have a plethora of Coca Cola products, but that is probably the penchant for the country to establish local bottling plants to spread the beverages as far as possible. There is only one country that has McDonald’s that I haven’t been able to visit, and that was Iceland. It certainly wasn’t for lack of desire, but this was the one developed country that didn’t have a McDonald’s that was centrally located downtown near the tourist areas. I kept seeing one on the outskirts of Reykjavik when I was on bus tours [right next to a Taco Bell- which is extremely rare to find outside of the United States], but was never able to find it in my rental car. What I have found in all these McDonald’s is that there are some interesting similarities and interesting differences. 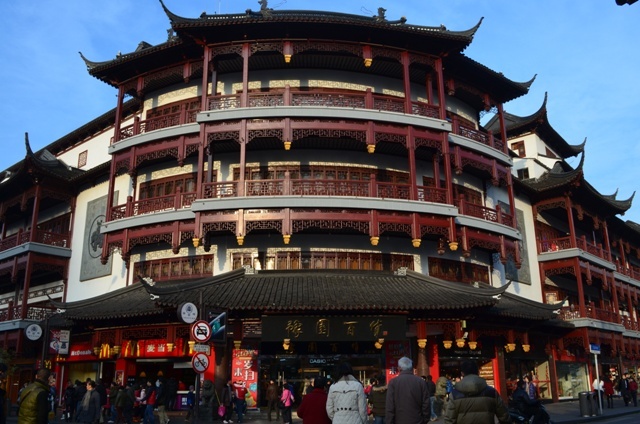 Many of the restaurants were located in actually beautiful and historic places. 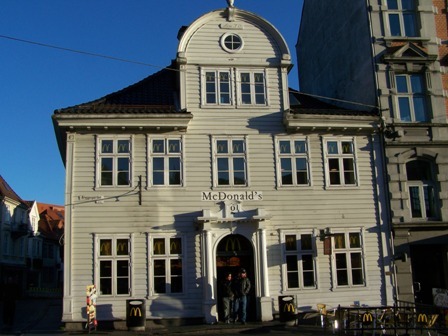 One in Bergen, Norway was in this beautiful , 19th century clapboard building (see above). I’ve eaten at a McDonald’s next to the Spanish Steps in Rome (though it wasn’t there anymore my last visit), and I’ve eaten in one right across from the Pantheon in Rome. You could eat your American fast food burger and fries outside al fresco and take in the view of the piazza and the ancient building. Talk about a clash of cultures. In all these multitude of McDonald’s the only things standard to all of them are the fries, Big Macs, and some sort of McChicken sandwich. EVERY SINGLE McDONALD’S in every single country has their value meal number one as the Big Mac value meal, just like the United States. After that, it’s all up to regional tastes. I have seen things at McDonald’s you would never find in the States. Stuff like bulgogi burgers in Korea, calamari wraps in Germany (among a multitude of other regional items), and other things. Names might be different for even the same item. For those who have watched the movie “Pulp Fiction” , you are undoubtedly familiar with Quarter Pounders renamed Royales. In most McDonald’s in Europe you can get mayo instead of ketchup, which is a taste I acquired and continue to this day. U.S McDonald’s deliberately fill the cups with ice so you get less soda and they pocket more profit, but you are pretty lucky to find many ice cubes in McDonald’s in other countries (or in other restaurants for that matter, but that’s a post for another time). My American traveling friends and I sometimes joke that McDonald’s is the “American embassy” just because it is so prevalent in many countries. I can’t really say I eat there because of any great need to maintain some sort of American touchstone. I guess I do it, just to compare the different experiences around the world.